Tenants of one of the new build bungalows, Mr and Mrs Richmond, pictured with (L-R) Councillor Bruce Laughton, Rebecca Rance, Jim Burman, Andrew Fearn and Chris Tutin. 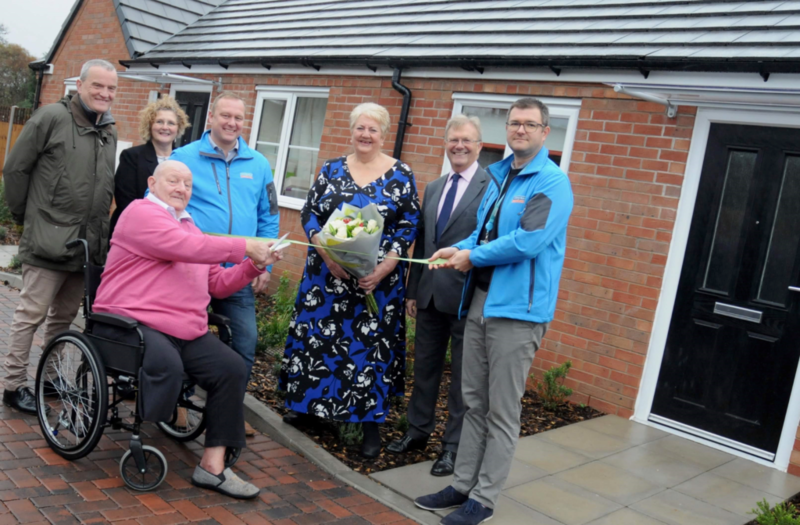 The first 50 homes are now complete in Newark and Sherwood District Council’s housing development programme, with tenants moving in across the district. As part of the programme, which is being managed and delivered by Newark and Sherwood Homes, the council has pledged to deliver 335 new homes for local people over the next five years. Working in partnership with local construction company, Woodhead Group, the new homes have been built across 21 different sites and include houses, bungalows and apartments. The sites completed to date have been clustered together in five different areas, including: Balderton, West Newark, Farndon, Newark and Collingham. Local tradespeople and suppliers have been used throughout the delivery of the new homes and so far the programme has created six full time jobs, provided 16 people with work experience opportunities, engaged 398 young people and delivered 48 training courses. More than 97.88% of labour and materials have been sourced from within a 40 mile radius. All the sites are assessed and measured against targets, set out by the national accreditation body, the Considerate Constructors Scheme (CCS). This looks at the way a site is managed, how a workforce is looked after, how local communities are engaged in the process and how the local environment is cared for. So far the Newark and Sherwood sites have all performed above the national average, scoring an average of 37 out of 50. Chris Tutin, Head of Commercial at Woodhead Group, said: “Working on a longer term programme such as this allows us to develop strong partnerships with our clients and the communities we work in. Being able to do this in the same district we’ve been based in as a company for the past 72 years, is even more special.